My father is the man. Lemme splain . . . Issa too mucha, lemme sum uppa. Tonight’s soccer game was a semi-finals match for the CONCACAF Gold Cup. The teams? 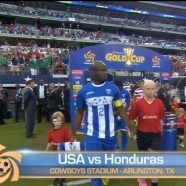 Honduras vs. USA and my father is an American citizen originally from Honduras. He loves America. He came to the US legally in 1968 and quickly joined the Army. He has unquestionably demonstrated his allegiance for this country to a degree most others, fortunately, have never had to do. When asked about tonight’s game he said America should win but whomever wins is the best team. Underneath the hip hip hooray I could tell a part of his heart routed for the place he came from. Maybe he saw the faces of young men who, like, him, may have been born dirt poor in an already poor country; and when I use the term ‘dirt poor’ I mean that the floor in my father’s home (which was a tin shack) when growing up was the dirt. He grew up poor but – more importantly – he grew up loved, he got himself an education, learned English, got married, filed his papers for America, came over, joined the Army during Vietnam, had a son, came back home, started working as a custodian in AT&T and worked his way up through the company to retire a few years ago as a computer system analyst responsible for the maintenance and upkeep of nationwide networks. Homeowner, worker, husband, father, grandfather, American. My father is the American Dream. Still, tonight’s game may have given nostalgia to where he came from and how far he has come. A heart longing for a country that is struggling but gave him his drive and foundation on life and the nation that gave him everything else in the form of opportunity and freedom. In the end, USA won the game by a score of 3-1 and he said it was a good game and he was happy America won, but maybe this humble and quiet man wanted to see if a couple of guys from Honduras might fight the impossible odds and win everything, like he has.